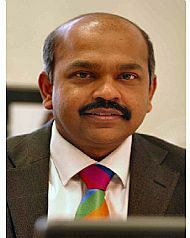 Profile: Dr Antony is an Associate Professor at the School of Chemical and Process Engineering, University of Leeds. His primary research interest is in the area of Particulate Mechanics and Physics, especially on the bulk behaviour of powders and grain under industrial process conditions as a function of particle-scale properties. He performs a number of inter-disciplinary research projects including in the area of biosensing of human eye. He uses a wide range of computational tools such as DEM, FEM, theoretical and experimental procedures in his research. He has obtained the prestigious MIT Young Researcher Fellowship Award for Exemplary Research in Computational Mechanics. He has made several publications in reputed international journals and conference proceedings. He serves as a member of editorial boards for many international journals in his filed including Journal of Nanotechnology and Research Letters in Nano Technology. Also, he serves as a regular referee for several international journals, including Physical Review Letters and Physical Review E. He has served as a guest editor for the Jl. Granular Matter and the lead editor of the book ‘Granular Materials: Fundamentals and Applications’, published by the Royal Society of Chemistry, London in 2004. He is a member of many professional bodies worldwide. His research sponsors include EPSRC, Royal Society, DTI, ICI, BNFL, P&G, Pfizer, Borax Hosakawa Micron, Bridon International Ltd, Merck Sharp & Dohme, DuPont and Kayser-Threde. His biography is included in the Edition of Marquis Who's Who in the World and the Directory of International Biography Centre, Cambridge. Molecular, Nano and Micro Mechanics, Granular Materials and Powder Technology, Space Engineering, Bio stresses, Extracting Resources from Wastes and Inter-disciplinary Research. Antony, S.J. and N.P. Kruyt (2009) ‘Role of interparticle friction and particle-scale elasticity on shear strength mechanism in three dimensional granular media’, Physical Review E, 79, 031308.